The small coastal town of El Médano in Tenerife has for many years attracted surfers from all over the world in search of the best waves. 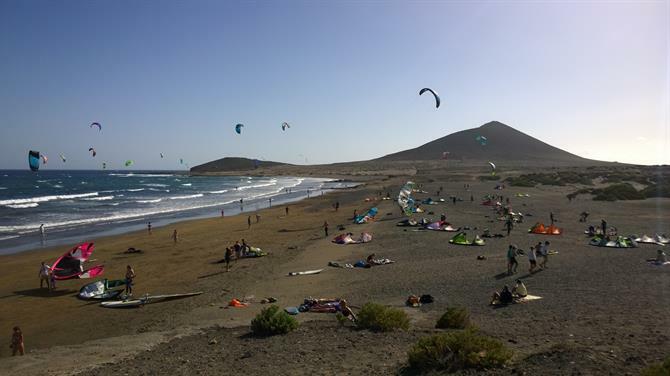 El Médano is considered to be a surfers paradise and is known for its shallow beaches and its picture-perfect location, right next to the mighty "Montaña Roja" mountain. 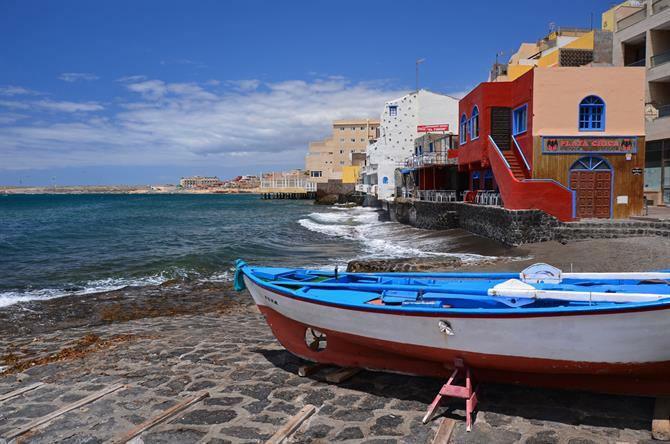 Although El Médano's popularity as one of the best holiday destinations in Tenerife and water sports paradise seems to be growing, the surfiest town in Tenerife has still managed to maintain some of its original fishing village feel. El Médano began to catch the attention of holidaymakers not long after the tourist boom of the early 1980s until then it was one of the best-kept secrets of the south. El Médano's charm can be defined with two words: access and attitude. Some of its popularity has to do with its location being just a stone's throw away from the southern airport Reina Sofia and ideal if you are staying in the south of Tenerife. With a different feel than the upscale destinations of the island, experience this hippie town with an extremely relaxed and welcoming atmosphere. El Médano is known for welcoming surfers and other watersport fans year around and it is home to different world championship competitions as well. El Médano probably ranks at the top of every European professional's list of best surfing spots around. Almost half of the inhabitants are not originally from the town according to statistics from 2013. This once a tranquil fishing village gets the majority of its income from tourism and people renting holiday homes in El Médano, but there are still few fishermen that head every morning to the sea to get some fresh fish for the town's restaurants. 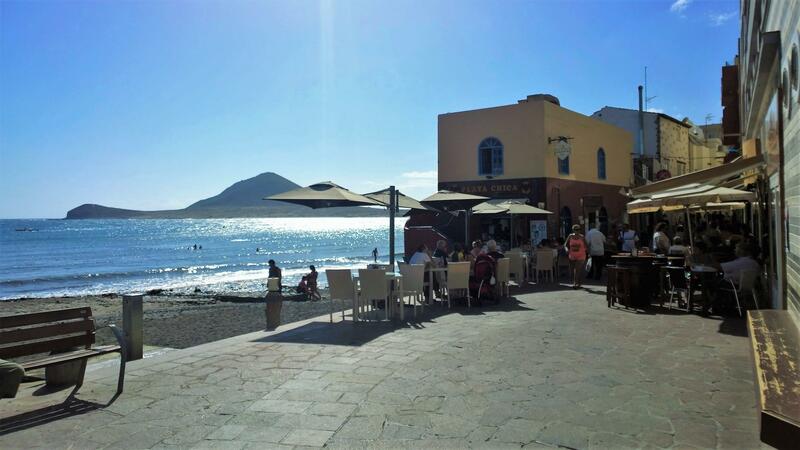 Here you can't find the sassy and chic bars like in Playa de las Americas to let your hair down. El Médano is a typical surfing town that favours "all natural" shops, relaxed bars and live music cafes rather than noisy nightclubs and English bars playing the worst of the 90s. You'll find some excellent, reasonably priced restaurants in El Médano - many holidaymakers and locals come here to enjoy a lovely lunch in one of the seafood restaurants facing the beach. El Médano is the perfect choice for a surfer traveller who wants to enjoy of the culinary delights of the Canary Islands and experience the real culture away from the hustle and bustle. 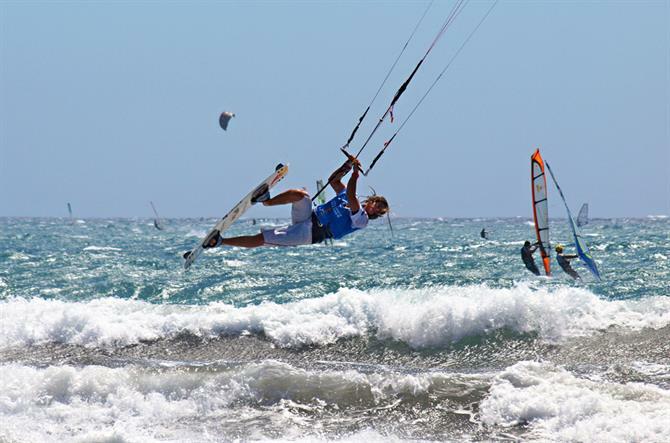 You will be able to enjoy a variety of different watersports activities in El Médano; kitesurfing and windsurfing being the most popular choices. There are plenty of watersport equipment rental companies at the end of the beach boulevard, just where the long Leocadio Machado beach (also known as El Médano beach) starts. You can try anything from standup paddleboarding to kayaking. Leocadio Machado has carried the recognised Blue Flag certification of the Foundation for Environmental Education for years and you'll find public toilets and showers right on the beach. There are several watersports companies offering lessons and courses for those who want to get up to their neck in the world of surfing. For those who prefer to ride on wheels, there are plenty of bicycle rentals companies in the town. You can head to the quieter Montaña Pelada beach or to the charming fishing village of Los Abrigos. Plaza de El Médano square in the centre of the town is the heart of El Médano and many music concerts and other local festivities take place here. 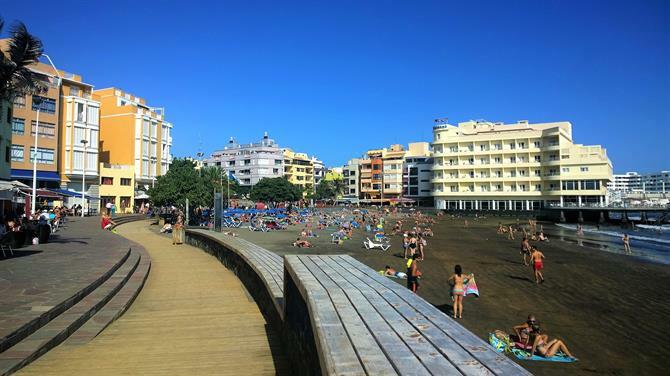 There are plenty of cafés, bars and restaurants in the square and in the beach next to it, where you can enjoy the delicious specialities of Canary Islands. The striking Montaña Roja (Red Mountain) is only a few kilometres away from the town. Montaña Roja is a volcanic cone of 171 metres that lies in the heart of the Reserva Natural Especial Montaña Roja natural reserve. The mountain is a result of a coastal eruption and you'll be able to find natural sea water pools, spectacularly coulured sand and rock formations and caves hidden on the rocky shores of the mountain. You can also walk on the top of the mountain, but you must be aware that the paths are rocky and might get slippery after heavy rain. 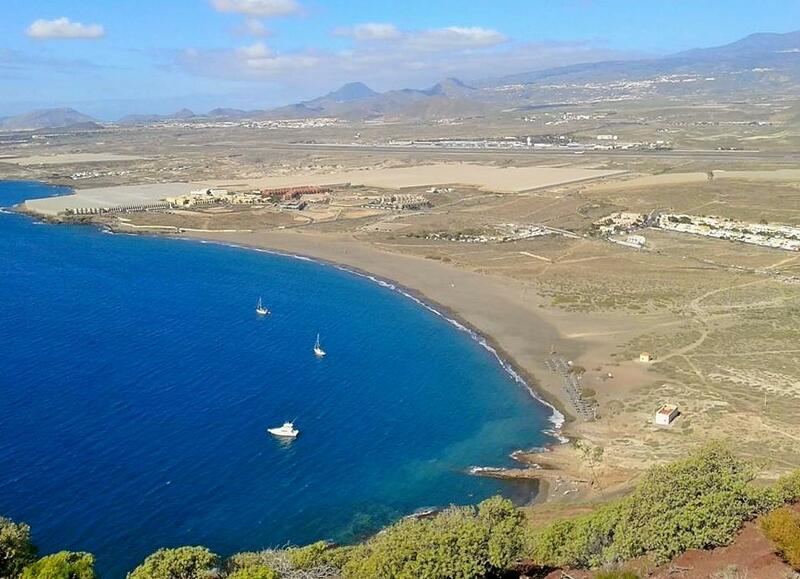 The views of the sea, island and Teide volcano, however, are worth the climb. On the other side of Montaña Roja, you'll see the longest and widest natural beach of Tenerife: La Tejita. La Tejita has a naturist section and it is very popular among the locals. 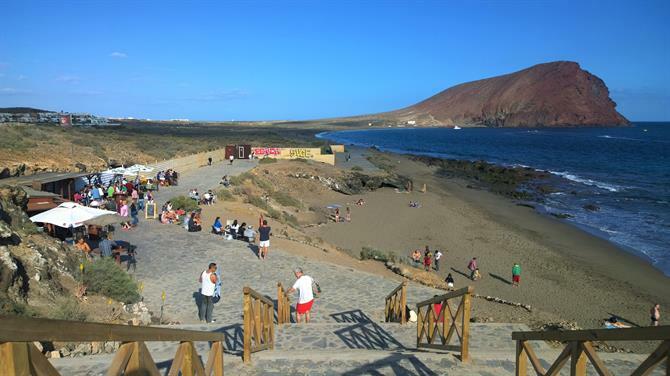 The beach can be windy at times, but the easternmost part of the beach, right under the Montaña Roja mountain gives some shelter and shade. On the west side of Le Tejita beach, you'll find a laid-back chiringuito right on the beach. Chiringuito Pirata serves excellent home made food and refreshing beverages with extremely reasonable prices. Try their ceviche and enjoy the relaxed atmosphere that tourists have not discovered, yet. El Médano is a fantastic destination for those whose idea of a perfect holiday is to never get out of the water. 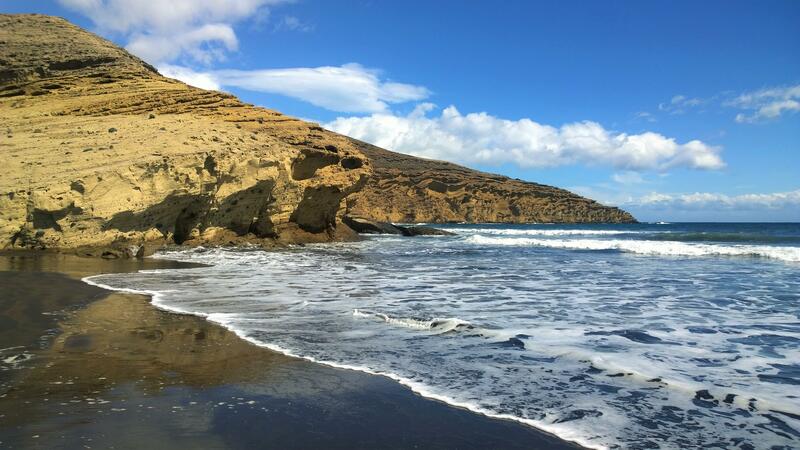 If El Médano sounds like a nice place to you, discover the other 5 fabulous seaside villages in Tenerife South.